A few weeks ago, one of my clients handed me his new Blackberry Z10 and told me that it wouldn’t sync to his calendar or contacts via Outlook. Honestly, I thought he had lost it, how could BB release a product without this core functionality. Well he was right! It didn’t sync via Outlook at all (since this incident, BB has added this functionality in its newest desktop update). The client would soon be leaving for an overseas trip and needed a solution asap. My clients company uses Google Apps for Business (free version), and had previously connected their phones to their systems, via a USB cable, to sync their calendar and contacts. (I am amazed at how many of my clients still sync their phones using a direct connection.) Because he hasn’t moved to the paid version of Google Apps, we are unable to use the Google Apps Sync, which syncs your Google accounts with Outlook, and in turn, syncs wireless to your device. Luckily, we had just purchased a sweet ultrabook with Office 2013, which gave us the tools we needed to come up with a solution for him quickly. First, we created an Outlook.com account and connected it to Office 2013. Then we copied all of his contacts to Outlook.com. Next we added his calendar events to the Outlook.com calendar. Now, we added the Microsoft Outlook.com account to his BlackBerry. He was now able to see his contacts and calendar. 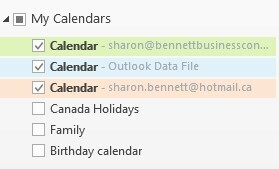 Moving forward, he adds all his new contacts and calendar events to the Outlook.com accounts via Outlook. This solution has been very successful. He can access his contacts and calendar anytime, and no longer needs to plug his phone in. One less cable to carry. This also provides a backup for his critical data. Our next step is to start using the SkyDrive integration to share files while he is on the road. I have been finding that as each service updates, it’s getting harder to have these services work together as seamlessly as it has in the past. Personally, I feel the providers are forcing the users to pick one environment, whether it’s Microsoft, Google, or Apple. All this does is frustrate the users, because it takes away previously had functionality and forces the user to pick a service which best meets their needs; and they may have give up, or modify, workflows to get all the functionality they used to have by combining the services. how well accomplished this site is. Email Affairs – My Version of “50 Shades of Grey” IT and Small Business – It’s the perfect fit!